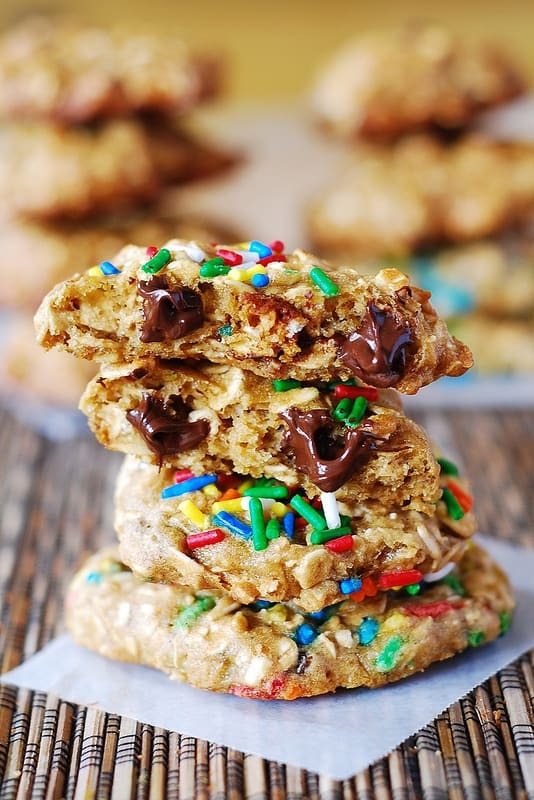 Low-fat banana oat chocolate cookies made with only 2 tablespoons of vegetable oil, the rest of fat is replaced with Greek yogurt and mashed bananas. These cookies are soft and chewy! A Holiday version, with sprinkles! 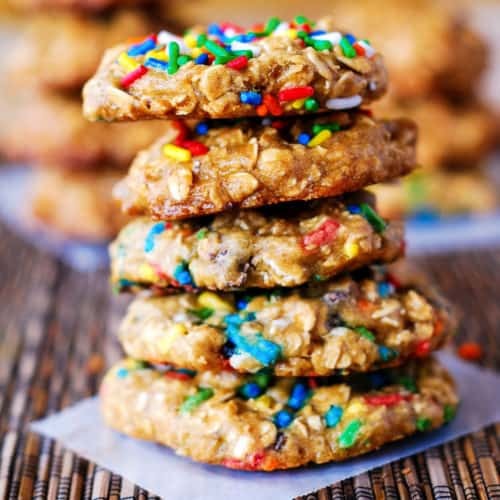 These have been my favorite oat cookies this year! I like them to be on the chewy side (vs. cakey), and this recipe fits the bill, thanks to the old-fashioned (or rolled) oats, bananas, and Greek yogurt! 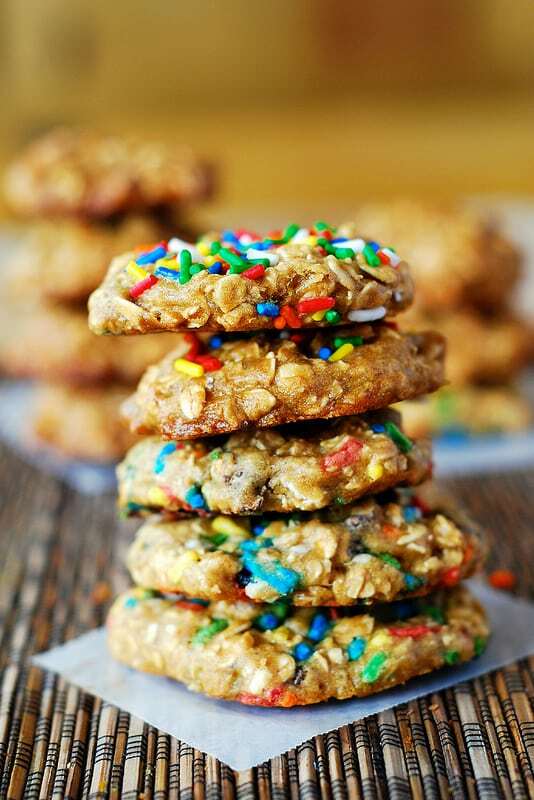 Only 2 tablespoons of oil are used in this recipe, and, instead, very ripe mashed bananas and Greek yogurt make these banana oat cookies moist, sticky, chewy, and very well put together, if you ask me! Since we’re in the middle of the holiday season, adding sprinkles seemed like a perfectly good idea, especially because I don’t have anything else right now to decorate the cookies. 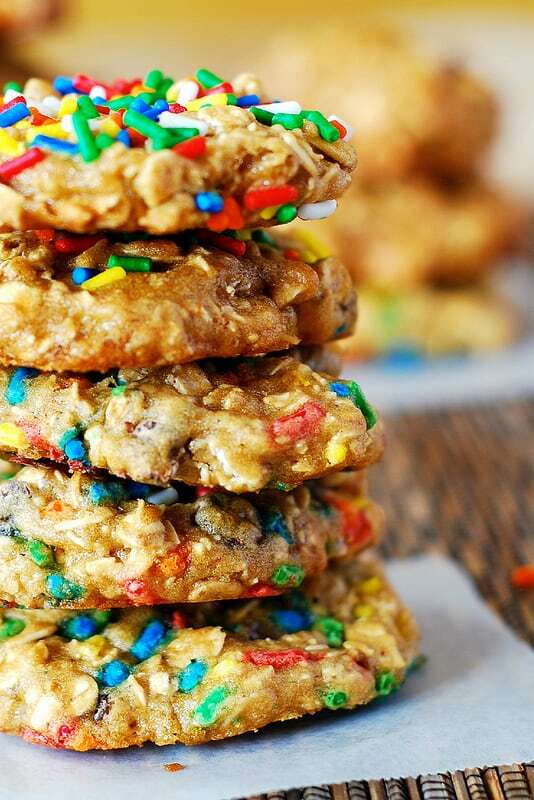 And, because the sprinkles are the easiest way to dress up a cookie! 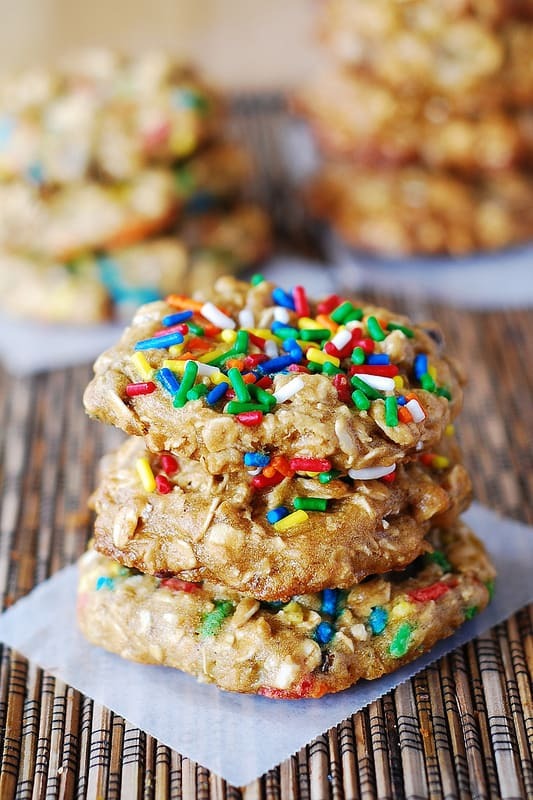 Now, I can rightfully call these banana oat chocolate cookies my holiday cookies! Remember, if you want the cookies to remain thick as they bake, chill the cookie dough for about an hour before baking. If you want them to be flatter – you don’t have to chill the dough. This recipe for low-fat oatmeal chocolate cookies has long been my favorite – give it a try – it might become your favorite, too! Low-fat banana oat chocolate cookies made with only 2 tablespoons of vegetable oil, the rest is replaced with Greek yogurt and mashed bananas. These cookies are soft and chewy! Make these festive by decorating them with sprinkles! Pre-heat oven to 350 degrees F. In a large bowl, combine together the flour, baking powder, baking soda, cinnamon, and salt. In a separate bowl, mash the banana. Add the egg, oil, brown and granulated sugars, yogurt, and vanilla and whisk to combine. Add the banana-egg mixture to the flour mixture and stir until just combined. Fold in the oats, then fold in the chocolate chips. Line two baking sheets with parchment paper. Take a tablespoon of dough, form a ball and drop the cookie dough ball on the prepared baking sheet. Repeat, spacing the cookie dough balls about 2 inches apart. At this point, I would refrigerate baking sheets with cookie dough balls for about an hour to chill the dough. This will ensure that cookies, when baked, will not flatten out, and that they will remain tall, so that we end up with thick and chewy cookies! Bake for 12 minutes until cookies are slightly golden brown. Let the cookies cool on the baking sheets for 5 minutes, then transfer to wire racks to cool completely. The first method is to form cookie dough balls, let them bake for half the time (5 minutes), quickly remove the baking sheet from the oven and sprinkle the sprinkles on top, then put the cookies back into the oven to let them continue baking for another 5 or 7 minutes. The second method is to add sprinkles to the cookie dough as you are forming the cookie dough balls. I personally prefer the first method, as it results in better texture and better looking cookies. I just made these and after finding the recipe on pinterest. I was recently diagnosed with gallstones so I have to be very careful of my fat intake to avoid agonizing stomach aches. I love that this recipe is lower in fat and still tastes pretty great. I added a splash of flax seed to mine. I think next time I’ll go for a finer salt instead of kosher. I kept getting big, crunchy grains of salt in every other bite which I didn’t really like. Otherwise a great recipe. Thanks! oooh I love that these are chewy, and those melty choc chips-MMM! Have I been eyeing on rainbow sprinkled desserts on your blog lately? I need to use some bright decorations in my desserts like yours! Hope you had a wonderful holidays! Wishing you a Happy New Year, Julia!